Hunter OMS hold regular FREE patient information evenings regarding services we provide within our practice – keep an eye open in Newcastle Weekly and our recent posts on this site for upcoming dates. 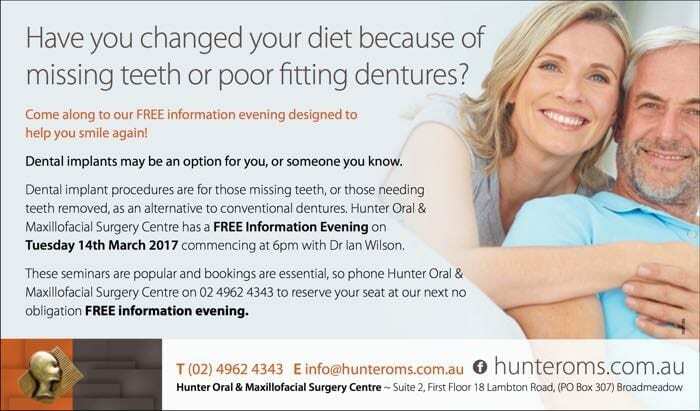 The next FREE info night is Tuesday 14th March regarding missing teeth and dental implants. Our info nights start at 6pm at our rooms, there are limited seats available so please call or email us to register, or contact us for more information.